Some people say the Banana Daiquiri was invented in Cuba in the late 1800s, while others claim that British restaurateur Conrad Graves debuted the cocktail at his Mountain Top bar in St. Thomas, U.S. Virgin Islands, during the 1950s. The origins are as cloudy as the drink but Mountain Top bar claims to have served 6 million of them throughout the years! So they win in my book. The popularity of this frozen daiquiri surged in the 1980s and became associated with the veritable vortex of poorly made uber sweet frozen daiquiris that flowed from slushy machines at faux tropical bars. Honestly, I would never even think of ordering one if it was not for the talented bar team at Painkiller Tiki Bar in New York City. Boccato, Gonzalez, and company have resurrected this once classy refreshing go-to-cocktail for the holiday in Havana set and introduced it to a brand new generation of tipplers. Please note - when ordering the Banana Daiquiri at PK, simply ask for "The Fredo". Why The Fredo? No, it is not a homage to your dashing correspondant (I wish)! 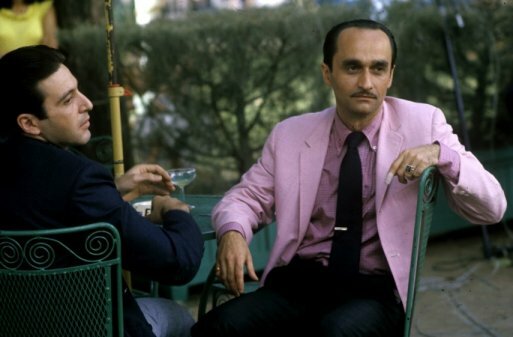 It is named after Fredo Corleone's favorite drink during the Cuba scenes in Godfather Part II. Painkiller bartender Enzo Lim was kind enough to share the recipe for this new favorite. Combine ingredients in blender. Blend. Serve in a chilled glass. Garnish with a banana segment speared with an umbrella. Most recipes on the web call for triple sec or curacao and sugar to be added - we disagree. This classic simple version at PK gets the balance right. The flavor of the banana only enhances the smoothness of The Fredo. It is similar to a piña colada in consistency and goes down just as easy. Don't get passed over - order one next time you are at Painkiller. Angolo di Modo: Cocktails at Tiffany - Who Knew?